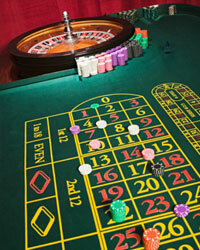 Roulette tables have two different types of layouts: one version is European and the other one is American. Although both layouts are very similar in terms of function and form, there are still some crucial differences between the two. Since a lot of people get confused when it comes to the different table layouts for roulette, here is a detailed explanation in order to help you get a clearer understanding of both of them. Looking at the two types of table layouts for roulette, a lot of players won't notice any big differences at first. However, upon closer look at the details, you will begin to see some crucial differences. The first obvious difference lies with the roulette wheel. In the European version, the wheel only has one zero, but in the American version, the wheel has two types of zeros: a single and a double. Although this may seem like a small and insignificant difference, it actually has a great impact on the two layouts. The lack of a double zero in the European version causes it to have a much lower house edge. See, in the European layout, the house edge is only a little bit higher than two percent. However, with the American table, the house edge is higher than five percent. Because of this, the European version of the roulette table is the best one to play, because it gives you better chances of winning overall. The second main difference between both table layouts is that the wheel of the European version looks more symmetrical while the American wheel is more practical. On the European wheel, the numbers are organized into pairs. Each pair is opposite from one another. In the American version, on the other hand, the first and last 18 numbers alternate. Also, the mixture of odd/even and red/black are nearer to one another. Yet another difference between the two layouts would be the tables' physical size. The European one is wider and the arrangement of the bet positions varies from the American one. The European layout's side bets are split into half, as well, while the American version's aren't. Plus, the side bets of the European layout are usually written in French, with the English translation located under it. Lastly, it would also be important to note that a lot of variations of these two table layouts exist, such as the British version, the French version, the African version, and the Canadian version.